Where to Buy Sign Supplies For Businesses in Bulk? These Sign Supplies Are Affordable and Easy to Hang, Ideal for Any Company. These Sign Supplies are Shipped by the Thousands from our Warehouse! 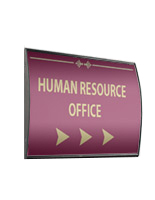 Comes with a non-glare lens to prevent glare from hindering view of displayed business signs. 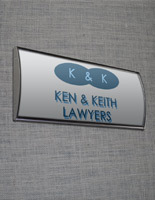 These nameplates, sign supplies can be affixed to most flat surfaces, in both upright or horizontal orientation. 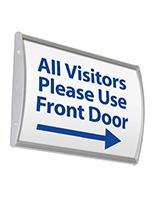 Every sign supply frame is fitted with double-sided VHB tape on the back. 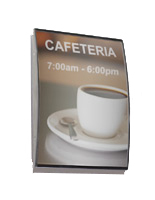 These sign supplies, also recognized as foyer signholders, can also be utilized as wayfinding or directory showcases by fastening numerous frames to the wall in a group. 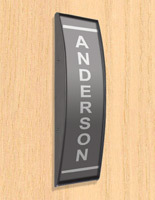 Put these name holders for inside use in an entryway or foyer setting to help new workers and patrons find the right location. 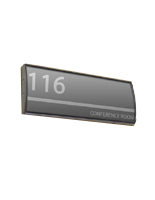 The black finish of these sign supplies with tape mount is suitable for coordinating with roughly any inside wall color or existing environmental design. 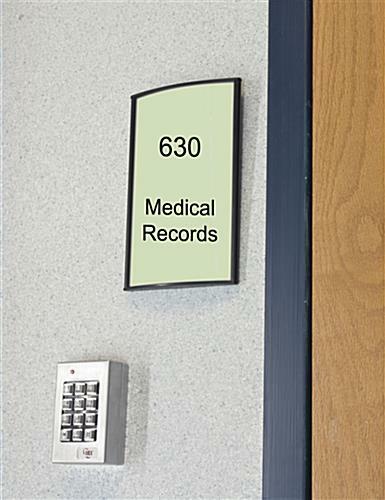 Sign supplies, lobby signs like the one observed at this site, are excellent to be utilized inside of banks, hospitals, educational institutions, studios and other business workplaces. 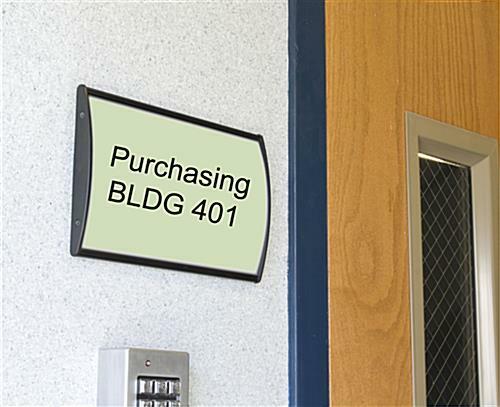 These inexpensive sign supplies that are designed for indoor use are a visually-pleasing means to exhibit corporate signs. 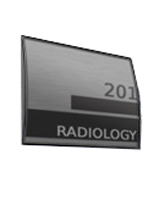 Fabricated from long-lasting anodized metal with acrylic end caps, these sign supplies can survive for several years to come, without going out of style! The nameplates involve an anti-glare lens for viewing ease and protecting the exhibited artwork from getting ruined. These wall showcases, sign supplies are sold without posters. Nevertheless, clients can produce and print their own signs using a ordinary printer. 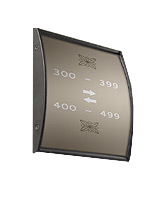 These sign supplies permit buyers to immediately and effortlessly modify their images as well. Merely utilize the supplied suction cup to lift the overlay, and put the prints below.